Over the past decade, there has been rapid growth in bioengineering applications in the field of spine implants. 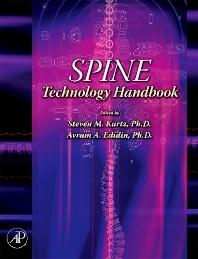 Spine Technology Handbook explains the technical foundation for understanding and expanding the field of spine implants, reviews the major established technologies related to spine implants, and provides reference material for developing and commercializing new spine implants. The editors, who have a track record of collaboration and editing technical books, provide a unified approach to this topic in the most comprehensive and useful book to date.